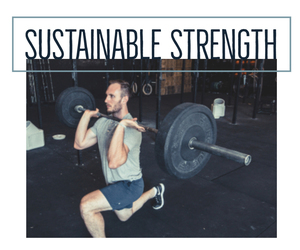 Sustainable Strength is designed for exercise enthusiasts with barbell strength training experience. This plan consists of 4 primary training days per week with an optional 5th recovery day. Our sophisticated programming combines circuit work with bodybuilding and power lifting movements. This balanced approach will increase strength, cardiovascular health, and mobility while helping you to avoid injury and joint pain. Citizen Athletics co-creators, Drs.Teddy Willsey of @strengthcoachtherapy and Sam Spinelli of @thestrengththerapist, are not only longtime gym rats and strength coaches, but also practicing physical therapists. Their hybrid skill sets and healthy skepticism of single-track, fad workouts put them in a uniquely qualified position to generate highly creative, well-rounded, and research-based workout programs for a range of fitness levels. The single most important factor in sticking with an exercise program is having a support system. We are that support system. Purchasing a guided workout is an investment in your health and a method to hold yourself accountable. It is the perfect way to take the guesswork out of exercise for less than the price of one personal training session. You will notice a difference in Citizen Athletics workouts. Written by two exercise crazed and passionate physical therapists, these workouts are creative, fun, engaging, and the perfect blend of challenging and do-able. The best way to get results in the gym is to stay healthy. The number one reason people stop exercising is because of injury. We know the best research based approach to avoid injury and we're bringing it to you.